No new software to learn, Gamut is intuitive, easy to understand, and grows with you. 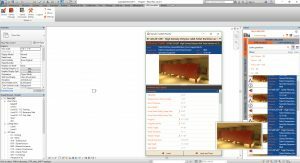 Search multiple libraries simultaneously… Local, network and web locations can customized to instantly load families, walls, floors, ceilings, roofs, and even materials. Preview the data and graphics… Ensure that the content you load is the content you want. Configure content before loading into the project… Load only the necessary family types, parameters, and materials to keep your project browser clean and file size small. Load everything for your project… Deploy family types, materials, and assemblies simultaneously. Stay Productive – Never leave Revit to load families or search for new content again. I have been working with Steve on programming projects for over a year now, and I can’t imagine working with anyone else. Aside from simply generating a high quality product, Steve’s background in design, Revit, and the industry makes working with him a collaboration. I don’t feel lost simply trying to explain “it needs to do this” to a programmer who doesn’t know the work I do; as soon as I start talking about what is needed, Steve understands and offers great feedback and ideas and brings excellent insight to what I need to accomplish and how to accomplish it.